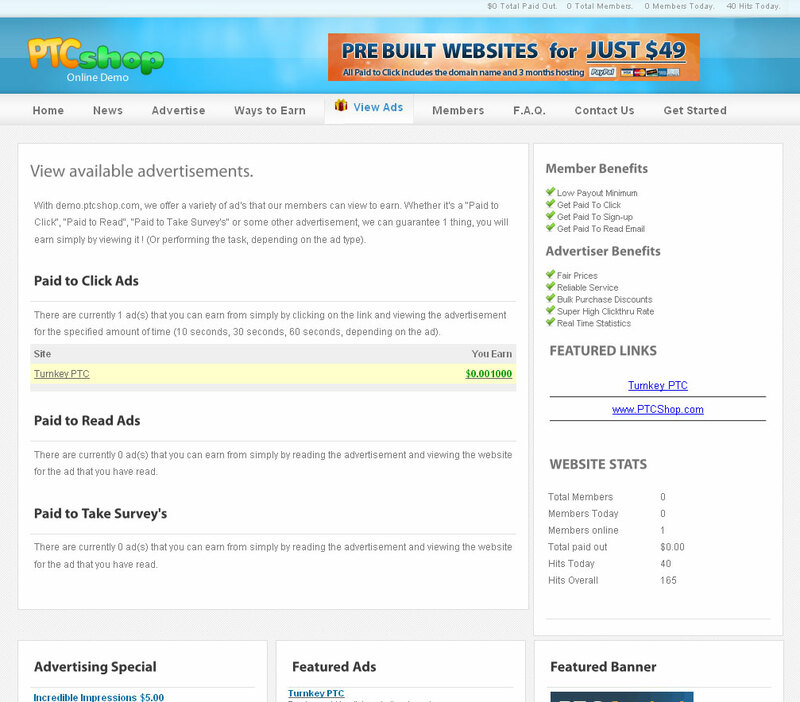 "Get Paid To PHP Web Script"
The PTCShop web script 2.5 is a feature rich enhanced "Get Paid To" website solution giving paid to click, read, signup and other features to your member's. Automated order's and withdraw's via Alertpay allow's for a much more streamlined online business system! 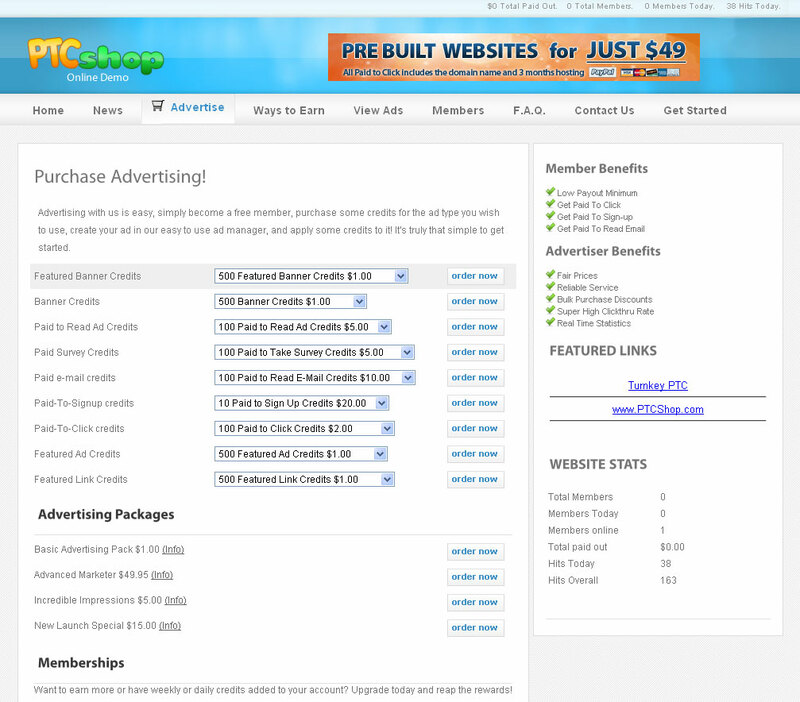 The PTCShop web script features a full web business with ton's of features and enhancements. Learn more about it by following the link below, or browsing the "Features" and "Demo" sections of our website. We offer a high quality web script allowing you to take control of your business. With membership management, automated alertpay payments, automatic order processing via alertpay and paypal and more , we have built our script to help you maximize your business and earning potential. 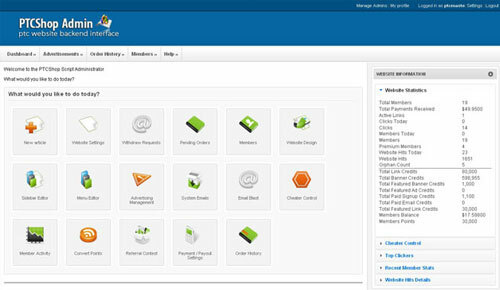 With PTCShop you get a professionally designed and integrated template to start your site off looking great. The site is fully customizable code, so feel free to make updates and changes!. 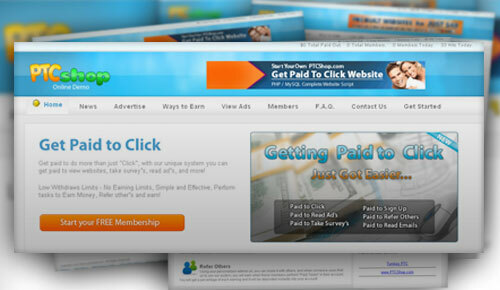 Our script is designed to provide an all-in-one solution for your "Get Paid To" business. With a full design out of the box, you can be up and running in no time with PTCShop. The PTCShop script features a "content editor" that lets you customize portions of the website, and if you need to make further customizations, all template files are in one location. 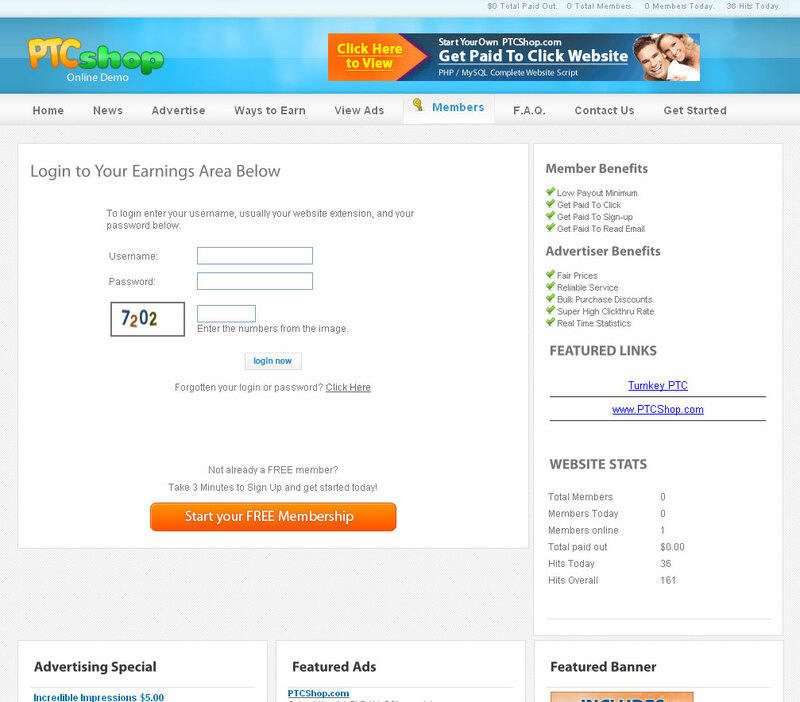 We have MASSIVE amounts of quality features designed to help you maximize your time and earnings with the PTCShop web script, from automated payouts to cheater control, our system is designed to help you succeed with your new website. 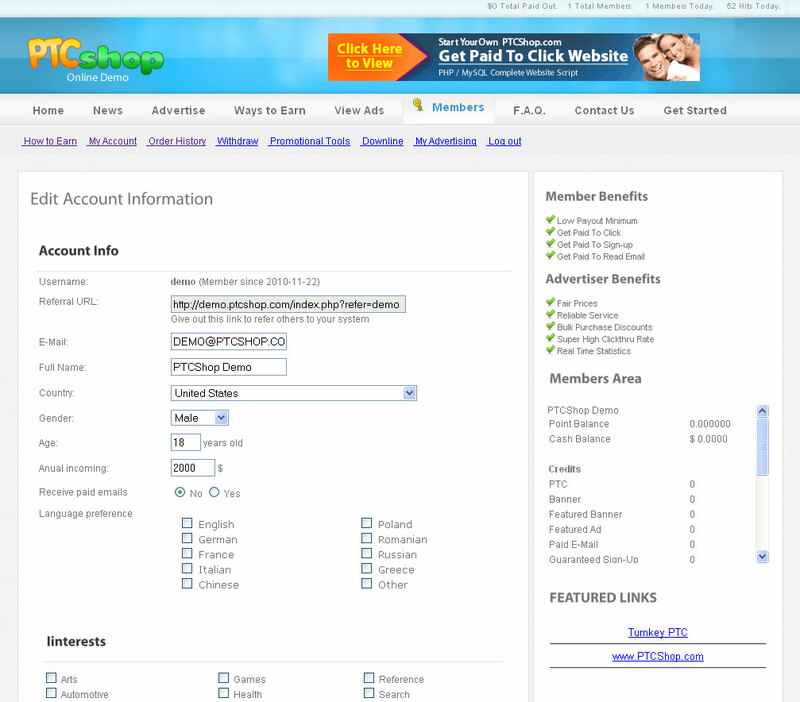 Enhanced control over your members and advertisements, the PTCShop web script has a new tracking system with enhanced statistics on members..
Stay in touch with your member's with mass communication tool's to help keep your member's informed about the latest news in your business. Advanced news article creator allows day by day news!. New membership management tools allow your member's to upgrade and get custom referral bonus's, custom timer's for advertisements, daily, monthly or yearly credit deposits automatically and more!. Enhanced advertising management area for all member's, free and paid! 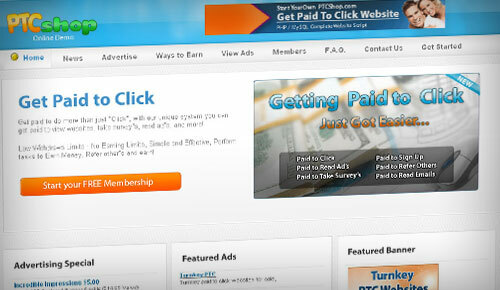 Simply purchase credits, create ad's, and distribute your credits accordingly. With the PTCShop web script, we have worked hard to make managing your business a simple, easy, and effective method for maintaining a valuble business on the internet.